WOW!! 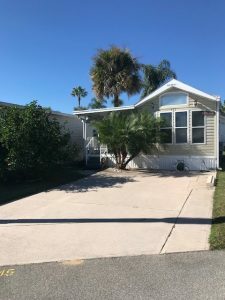 1 BED/1 BATH HOME with LOFT & BONUS ROOM CURRENTLY BEING USED AS A SECOND BEDROOM WITH A MURPHY BED!! This home features a nice outside covered front porch with Terex deck boards installed in 2015 and a nice size inside laundry area with a full size washer. The carpet in the main living area & bed room was replaced in 2016. Have guests?? No worries!!. You can use the bonus room with the Murphy bed and the grand kids can use the two twin beds in the loft area!! All of this is offered in a gated 55+ active golfing community with many amenities including access to Lake Davenport! !